There was a time, following a series of brain surgeries for bleeding on the brain, that Army Veteran Cathy Davis had trouble talking in ways people could understand her. Walking and getting around in her wheelchair either at home or out in the community was a major challenge. Now through years of therapy, the Colorado native who lives in suburban Maryland leads a very full, active life. In the photo above, Dr. Joel Scholten and Lucile Lisle assist Davis with exercises on the parallel bars as part of her exercise and therapy program. Scholten is associate chief of staff for Rehabilitation Services and VA’s national director of physical medicine and rehabilitation. Lisle is a recreation therapist with the Recreation Service and Polytrauma program. “I try to do everything possible on my own,” Davis said. And her active lifestyle shows she has made great progress, resulting from an individualized treatment plan coordinated through the Brain Injury/Polytrauma program at the Washington DC Veterans Affairs Medical Center (VAMC). She goes horseback riding every week as part of equine therapy. She works out regularly on exercise equipment in her half of her husband’s “man cave,” attends weekly luncheons with fellow Veterans, gives presentations in her Maryland community, works with college students and has given presentations at regional polytrauma conferences. She has taken part in adaptive sports such as skiing, rowing, golfing, kayaking and archery. 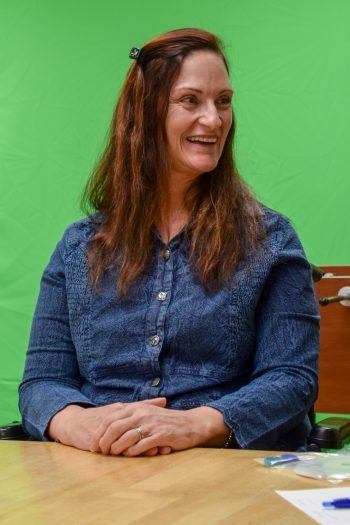 It’s all part of her individualized rehabilitation plan designed to maximize her independence following spontaneous bleeding on her brain in 1988 while serving on active duty in Germany and a second recurrence in 2007. As a result, she then could not talk or walk. 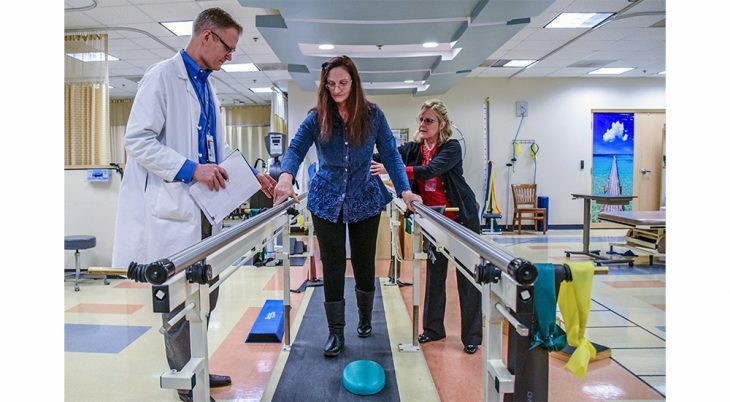 “Immediately after her bleeding on the brain, Cathy was severely limited in her mobility and coordination,” said Dr. Joel Scholten, who first saw her as the medical director of Brain Injury Rehabilitation Programs at the Tampa VA Medical Center. Dr. Scholten relocated to the Washington DC VA Medical Center and in 2009 he again began seeing and working with Davis to maximize her independence in the community through the outpatient Polytrauma Network Site clinic at the DC VAMC. Davis’ team has included multiple physicians (neurosurgery, neurology, physiatry, physical medicine and rehabilitation), as well as physical therapy, occupational therapy, recreation therapy, speech therapy, kinesiotherapy, vision rehabilitation and case management. “Our goal is to do everything we can to improve her freedom and mobility,” said Lisle who works regularly with Davis. Lisle utilizes word association games, animal-assisted therapy with therapy dogs, public speaking and community reintegration outings designed to increase opportunities for leisure enjoyment, use of her improved speech articulation, ability to engage in and be comfortable in social situations and to develop ways to assure her safety while in public settings. Such strategies involve working with Davis in her wheelchair to traverse inclines, negotiate doorways at shopping centers and restaurants and other regular activities in the community. In addition, she does luncheon meetings and presentations as part of her rehab plan and has greatly improved her communication skills and confidence. Now able to talk and communicate quite well, she has presented speeches for three years at the Annual Polytrauma Veterans Conference. Davis has given presentations about her personal history and on working with a therapy dog and learning commands. She is currently taking part in equine therapies and has been in horse shows. Of course, the Colorado native rides “Western saddle” style. VA also has made her White Plains, Maryland, home accessible for wheelchair use. And that is where she spends a lot of time on her stationary bike, a recumbent bike, and an elliptical where she regularly practices working on her balance and walking. Another added dimension of her care comes through telehealth, which enables her to connect with her doctors and therapists by video on her mobile phone, reducing her need to go back and forth to the medical center and enabling VHA clinicians and therapists to better gauge the impact of their treatment plan.